“Gorganzola,” “Mortadela,” “Italian’s Wedding Soup”… Italians are probably asking how we could not notice not one, but two misspellings; and what exactly is a “Wedding Soup?” Americans, on the contrary, have recognized some of the products that they usually find in the grocery aisles: products with Italian names, pictures, flags and wording such as “traditional,” “classic,” and “Made in Italy” that, except for the name and the evocative power, have little to do with Italy. This phenomenon is known as “Italian-Sounding,” and concerns more than the 80% of the Italian food products sold in the USA percentage that skyrockets for certain categories, reaching for instance the 97% when talking about sauces. This spread of fraudulent goods represents a serious damage to Italian producers that are unable to be competitive in the American market due to high export costs and the need to fulfil both long bureaucratic procedures, and production regulations. At the same time, consumers are attracted by deceptive packaging and lower prices that make them buy false products without even knowing. 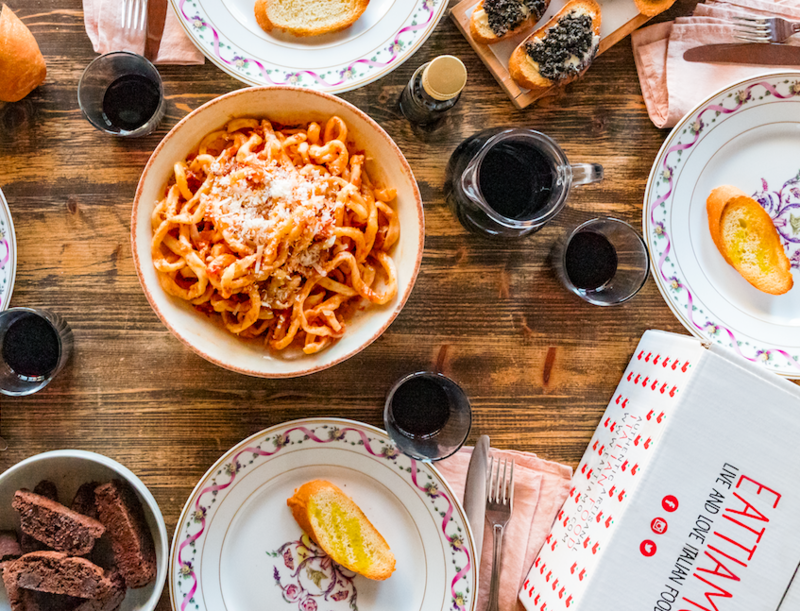 I Love Italian Food is elated to welcome EatTiamo to the family, an Italian startup born in the year 2015, with a mission to combat this problem. How? Delivering each month a selection of authentic Italian products directly to the home of hundreds of American families, and raising their awareness of the true Italian tastes—making them understand the stories and the traditional recipes behind each product with videos, articles, and leaflets. Each Box contains all the necessary information and ingredients for a full meal for 4 people, from the starter to the dessert. Producers are carefully selected. Small and medium-sized companies that use high-quality raw materials and are engaged in rediscovering the authentic Italian recipes are preferred. For many of them, EatTiamo represents the only possibility to reach a high-potential market like the American one. A lot of the EatTiamo boxes are themed according to the idea of rediscovering regional recipes: after the Langhe Box, featuring risotto and the hazelnut cake by Enrico Crippa, a three-starred Michelin chef. The Tuscan Box, with pici pasta and truffle, and in April it’s Emilia Romagna’s turn to travel overseas. Thanks to the advisories of food experts, EatTiamo has selected real Made in Italy products that respect the quality, traditions, and flavors of Italian food. The meal begins with a mushroom spread, and followed by egg Tagliatelle with tomatoes and porcini mushrooms. In the box, there are also special products such as tomato paste for overseas clients who would like to take on the challenge of making an authentic Italian ragù. The box also contains an unsurpassable dessert to follow this rich meal: honey from Acacia, of which is a DOC Emilia production. The April Box is a box of classic recipes, to tradition, but there are some EatTiamo boxes that are created solely to appeal to the trends of the American market, but without disregarding the research dedicated to authentic products in line with their mission. The “Italian Detox Box,” for example, has been created to satisfy the needs of customers with various intolerances and who are on the search for “healthy food.” Pasta made from white corn, eggplant sauce, Taggiasca olives, and artichoke spread are some of the products that represent the concept of well-being that combine both flavor and nature, as well as sheer enjoyment. Check out the video to discover how I Love Italian Food has decided to utilize the ingredients of the April Box.